If you had looked into the London sky last night, you might have seen Barry Greenstein rotating slowly through the air like a hairy balloon. 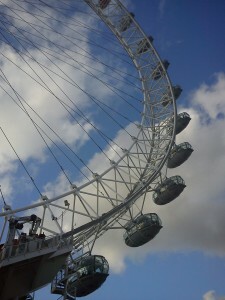 Which should have come as no surprise, were you standing at the base of the London Eye. Otherwise – I hope you enjoyed your drugs. Barry, Vanessa Selbst, Antonio Esfandiari, Matt Matros, Ali Eslami, Jennifer ‘Jennicide’ Leigh, and Isaac Haxton were representing the U.S.A. in the Nations Cup. A duplicate poker tournament arranged by the International Federation of Poker, as part of the UK Festival of Mind Sports. The action continues tonight inside the grand County Hall, which is directly behind where I was standing when I took that photo. Sadly, the UK team are already out of the running, but at least they have a short journey home. This should be a big week, whether its days of explosion or fizzle. Some might contend poker has already changed just having gotten to where we are today — with US Senators actively engaged in decisions immediately affecting the way people play online poker in this country. Gotta wonder how Greenstein’s perspective may have changed in the past four years, as he has been at least peripherally involved in poker policy ever since he made a declaration in 2007 that we were six months away from legally mainstreamed online poker. Michael “The Grinder” Mizrachi overcame a 3-1 chip deficit during heads-up to defeat Vladimir Schemelev and win his first WSOP bracelet along with $1,500,000 in the $50,000 Players’ Championship . Schemelev collects over $960,000 with his runner-up finish. David Oppenheim, who was chip leader when the remaining five players took their dinner break, finished third for $603,348. 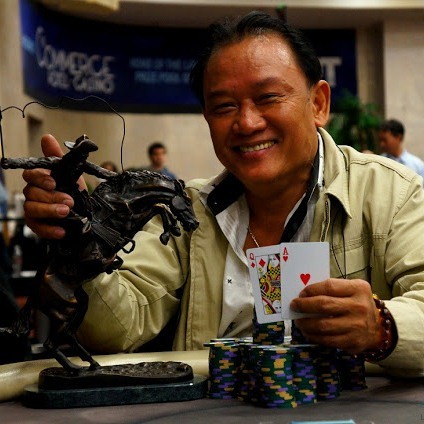 John Juanda ($436,865) and Robert Mizrachi ($341,429) finished fourth and fifth respectively. 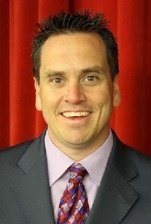 You can read Nolan Dalla’s tournament report here. The other bracelet awarded this morning was the $1,500 Omaha 8 or Better event, won by Michael Chow, defeating long-time pro Dan Heimiller in heads-up action. Chow picks up $237,140 for the win, while Heimiller adds $146,505 to his long list of cashes. Full results for this event along with Nolan’s tournament report can be found over at wsop.com. The $1,500 No-Limit Holdem event has 23 players remaining when play resumes at 2:30pm this afternoon, playing down to a winner. The chip leader is Vincent Jacques with 1,498,000. Notables remaining include Praz Bansi (616,000), online stars David Sands (628,000) and Yuval Bronshtein (498,000), along with three-time WSOP Circuit ring winner Dwyte Pilgrim (209,000). The full list of remaining players is available at wsop.com. 36 players, each guaranteed $16,607, remain in the $5,000 No-Limit Holdem Shootout when play resumes at 2:30 today. The remaining players will be seated at six six-handed tables. Those winners return Thursday for the final table, with the winner earning $441,692. Among the notables who won their table yesterday: Chris Ferguson, John Duthie, Chad Brown, Tom Dwan, Christian Harder, Blair Hinkle and Justin “Boosted J” Smith. The list of survivors can be found here. The $2,500 2-7 Triple Draw drew a field of 291 entrants for a 5pm start. After ten levels thet field was reduced to 87, with Salim Hanna the chip leader with 65,400 when play resumes Wednesday at 3pm. Plenty of big names remain including Hoyt Corkins, Allen Kessler, Jeff Lisandro, Scott Seiver, Ted Forrest, Barry Greenstein, and Archie Karas. For Team Pokerati followers, Tom Schneider finished 12th with 43,200 in chips, Pat Poels was 46th with 21,000, while Julie Schneider was eliminated on day 1. A full list of chip counts will be available soon at wsop.com. Wednesday has just one event starting today, the second $1,500 No-Limit Holdem event of the WSOP, with a 12pm start. The second $1,500 of the 2009 WSOP was won by Pete “The Greek” Vilandos, winning over $600,000 in a field of 2,506. PokerNews will have constant updates available throughout the day as the field plays ten one-hour levels. Kiplinger’s, the DC-based publisher of business forecasts and personal finance advice, appears to have “gotten” poker. A senior editor there attended a WPT boot camp (for a compilation story on adult camps), and before long he started seeing the world of investing and finance as a poker player … and that spawned a three-part series relating poker to all things economic. Learn to avoid emotional traps by playing a little Texas hold â€™em. Both are based on incomplete and unfolding information. A device featuring the wellness guru taught me to keep my emotions under control. So in conclusion, if I am surmising this right, the key to personal financial success in 2010 is play more poker. OK, got it.